Go Green with Solia Bamboo Eco Friendly Catering Tableware and Supplies! Are you an evironmentaly concerned Caterer, a 100% and more organic fan on everything that's related to food services? Got a Green EcoFriendly event to organize? 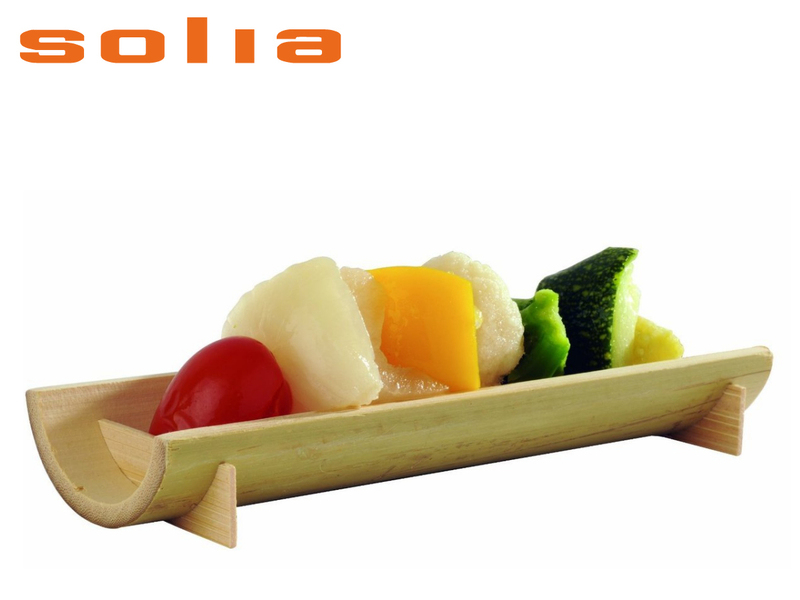 Solia USA developped the perfect solution for your specific needs with a whole range of Disposable Catering Supplys exclusively made of Bamboo leaves and by-products! Yes, Bamboo! Yes, the Panda's prefered meal! From small dishes to trays and skewers, you have a large variety of Bamboo Catering Table ware to choose from for your next event. Bamboo Leaf Thermoformed Bowl , ideal, ideal for serving small portions or Appetizers. Bamboo Leaf 4.7 x 2.4 x 1.2" Boat Dish, perfect for tasting asian small food or Appetizers. Bamboo Large Tokyo 5.9" Sushi Plate, your next big thing for presenting Sushi at Events & Buffet. Bamboo Golf 3.6" Skewers, the "you gotta have it" skewers for any Cocktail Party. Off course, as most of Solia USA Catering Tableware, all the Bamboo range of disposable tableware resists temperatures from 25ºF to 160ºF, giving you the opportunity to cool down or re heat your preparations directly in there serving dishes. When done, all Solia USA Bamboo tableware is recyclable and compostable. So whether you wish to bring eco responsability to your food-service business, giving an asiatic touch to a particular cocktail or simply because you like them, Solia Bamboo Bowls, Plates, Trays and Tableware is the prefect choice! At Solia USA,we make a wide variety of unique food packaging and disposable tableware solutions for catering, events, retail food service, the food processing industry, wholesale packaging and more. Solia is known for its innovative designs, durability and cost-effectiveness, making us a go-to option for your business or event.